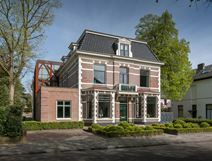 A unique office villa which was rebuilt in 2009; this office space was designed to impress whilst creating a comfortable working environment for doing business. The building offers superb facilities and services including security systems and parking spaces; all services can be adapted to suit each company's business needs. Apart from being located close to the city centre and In walking distance from the central station there are also parks in the vicinity. By car the A27 motorway is easily reached and Schiphol Airport is just a short drive. Well positioned in an area famous for radio and television broadcasting this centre finds itself close to the European headquarters for Deloitte & Touche, EMI Music and Nike. Offices in this modern building are provided with secure underground parking, 24 hour CCTV monitoring and relaxing lounge areas. The centre is next to the A27 motorway linking it to various routes including Amsterdam and Schiphol Airport. Located in the business park of Arena Park in Hilversum, this complex offer a range of smart office units which come ready to use. Offices come ready to use and fully equipped, with great flexible terms. You can make excellent use of professional space without a huge investment here. This space provides all the in-house amenities you need to ensure your day runs smoothly. There are several big players in the business park including Nike, Rabobank, Sony and many more.